Moldova's villages are heading properly for development. Hânceşti is a good example. In this district, several infrastructure projects were carried out in the past three years: aqueduct and sewerage systems, street lighting. PDM election caravan headed by vice-president Andrian Candu came to observe the results. The party listed a candidate from the district on constituency no. 38, Alexandru Botnari. PDM delegation visited a clothes factory with 150 female employees. Candidates spoke to employees about the PDM's social projects, particularly the ones targeted to encourage young people to stay home. "Under the state project First House, young people have chances to buy their own houses. Moreover, new mothers will receive higher indemnity. Childbirth allowance increases from 3000 lei till 6000 lei, we plan to raise it to 10000 lei", said Andrian Candu, vice president of PDM. "We have considerable changes in the last three years. We have better conditions now. Comparing with the first day they took office, our country has been changed positively and it will be better", said Liliana Cazacu, an employee. "Do you know what we ask you in the future? If the Democratic Party comes to power, please only place people with requested professions in the ministries"
"When we came to power, the government had 16 ministries. No, this little country doesn't need 16 ministries. We reduced till 9 ministries. Many of them have nothing to do with Democratic Party because only professional people were placed there", said Andrian Candu. 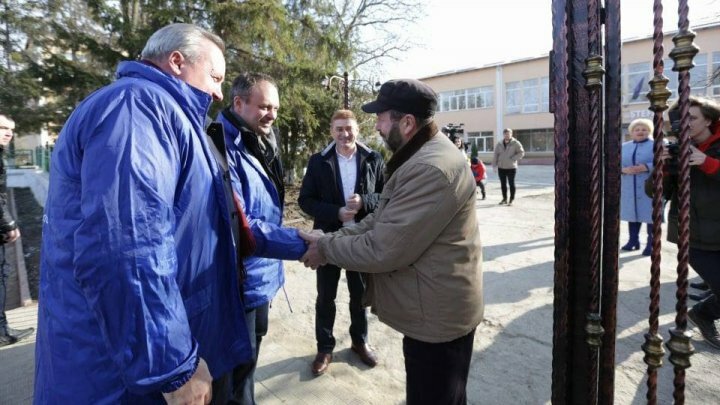 The candidates also reached the Royal Court in Lăpuşna village, a future tourist attraction. Ten million lei is allocated to renovate the building. "Republic of Moldova doesn't target only Chisinau municipality. We develop all regions so we will have developed country. I'm assured that the President observes this beautiful building here, I'm sure that we will tackle the problems together", stressed Alexandru Botnari, PDM candidate, uninominal constituency no. 38. - Do your wage increase since December 1st? - How do you feel about that? - We're happy for that. At the meeting was also the PDM candidate from the constituency no. 39, which includes localities from Hincesti, Leova and Cimislia districts. "We always strive to place people as priority. We're living with the needs of citizens", said Gheorghe Buza, PDM candidate on the uninominal constituency no. 39. "We will certainly vote on February 24. I will encourage people to return home because we a optimistic future and we can contribute for our future", a young man said. "They are trustworthy. They have more actions and less words", said another local.